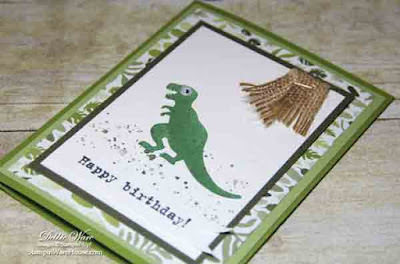 Diverting from Christmas cards to show you the birthday card I made for my Grandson. He loves dinosaurs! I stamped the dinosaur from No Bones About It in Garden Green onto a Whisper White panel. I stamps the splatter stamp from Gorgeous Grunge in Always Artichoke and a second time without reining. That is layered onto a panel of Always Artichoke then I attached a piece of 5/8" Burlap Ribbon with the Handheld Stapler. The stapler is being discontinued so grab one now. It takes a standard mini staple. 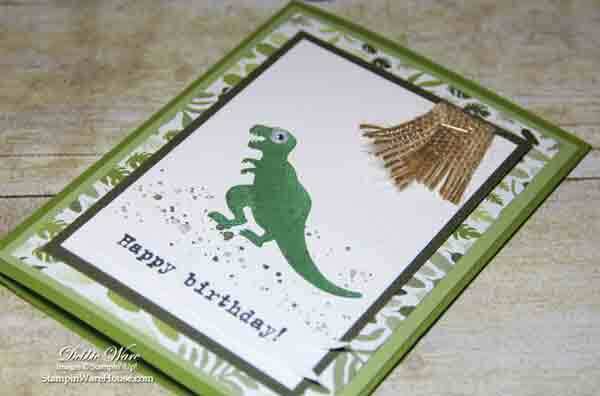 The dinosaur layers are placed on a piece of retired Designer Series Paper from Botanical Garden. 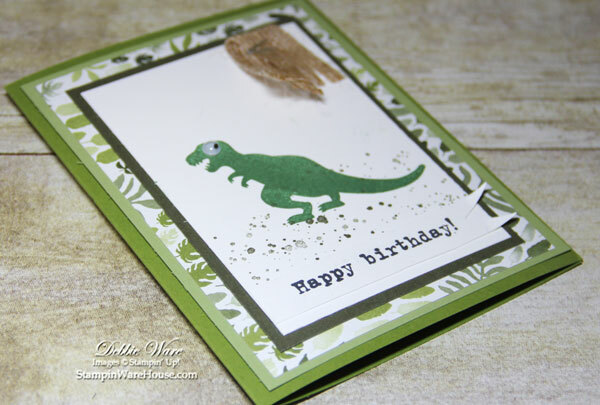 That's layered onto Pear Pizazz and finally I put it on an Old Olive card base. 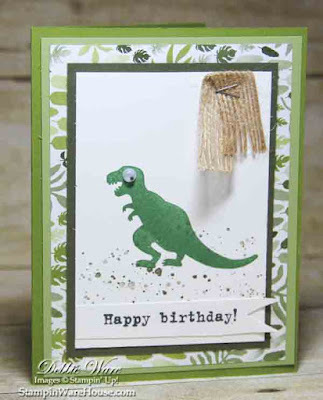 I added a googlie eye and stamped Happy birthday! from Party With Cake onto a banner and layered it on the top. Thanks for looking! Be sure to check out the great sale items in the Year End Closeout. Use December Host Code H43H9MF9 when shopping online with me. A Simple Thank You Card & Year-End Closeouts!